Californians who want to put solar panels on their roofs could benefit from a state bill headed to the governor’s desk. The Legislature on Thursday passed the Solar Permitting Efficiency Act, which promises to streamline the solar permitting process throughout California. 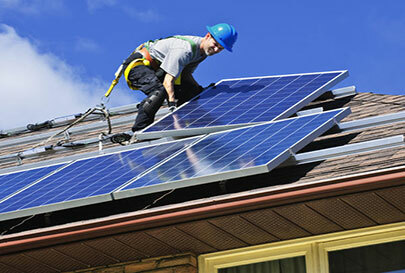 Industry officials say that could save each customer $1,000 or more on the cost of installing solar panels. Assemblyman Al Muratsuchi (D-Torrance) is the author of the bill, which requires cities and counties to adopt ordinances that will speed up the permitting and inspection process for residential rooftop solar energy systems. Muratsuchi was prompted to create the bill after a visit to Verengo Solar in Torrance last year, where company officials told him permitting processes in some cities and counties add delays to solar installation work. “They told me that it often takes 65 days to install solar panels on a person’s home, of which 64 of those days are spent wading through the local bureaucracy to get the necessary permits and approvals,” Muratsuchi said at a solar industry lobbying event this month at the state Capitol. Muratsuchi and solar industry officials say streamlining the processes throughout the state will reduce those delays, which can be costly. The bill also prohibits homeowner associations from passing restrictions that increase the cost of solar panel systems by more than $1,000. The California Solar Energy Industries Assn. said that while the price of solar has dropped since 2006 largely because efficiencies in manufacturing are bringing down the cost of hardware, expenses such as the costs related to permitting have remained stubborn. Will Craven, a spokesman for SolarCity Corp. of San Mateo, said that while the solar panels being installed on rooftops throughout the state follow uniform standards, the codes that regulate them do not. He said more than 500 jurisdictions of California have their own processes and code interpretations. Craven said some cities, such as San Diego, have expedited processes that work well. A new online permitting process rolled out by the Los Angeles Department of Building and Safety recently is promising, he said. Ryan Wiser, a researcher at the Lawrence Berkeley National Laboratory, looked at the effect of local permitting procedures on residential rooftop solar installations. That research showed efficiency in permitting could reduce costs for consumers. “Our research – past and current – shows that savings of up to $1,000 are plausible for a typically sized residential [solar panel] system,” Wiser said. Members of the solar industry say reducing costs will expand the market for solar energy, which will help add jobs to the state’s economy. "Streamlined permitting improves the deployment of solar, and will provide many benefits in Los Angeles and across the state, including job creation and energy savings,” said Adam Gerza, director of government affairs at Sullivan Solar Power. Muratsuchi said a recent UCLA study showed that if 5% of Los Angeles County homes had solar panels, it would create 28,000 jobs and reduce carbon gases by the equivalent of removing more than 225,000 cars from the road. "It's a big deal," he said. The bill passed the state Senate on a 22-1 vote Wednesday and it cleared the Assembly on a 66-1 vote Thursday. It goes next to Gov. Jerry Brown.